Alex Frenz grew up in Oakville, Mo., playing softball – and loving hockey. So it was a bit of a dream-come-true summer for Frenz, who interned from May through August behind the scenes with the NHL team’s strength and conditioning program. Naturally, it’s also something worth talking about. 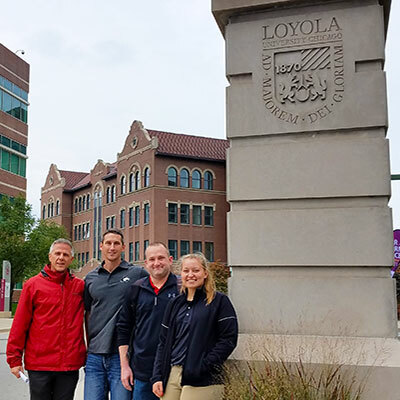 Frenz traveled this semester with three of her Department of Kinesiology and Physical Education faculty to Loyola University Chicago to attend the Personal Fitness Training Educational Institutions State Clinic and to deliver a presentation there on her internship. Organizers of the clinic are working to grow and establish a platform in which educational institutions can gather, share best practices and collaborate to bring foundational regulation to the field of Personal Fitness Training. Participants came from host Loyola, the University of Illinois at Chicago and NIU. Joining Frenz from Anderson Hall were Shaine Henert, director of the Kinesiology program; Clay Camic, associate professor of Kinesiology; and Brandon Male, internship supervisor for Kinesiology. She showed pictures of the various facilities and described fitness technology that included heart rate monitors and force plates, which measure balance, gait and other biomechanics. A textbook comprehension of kinesiology also has improved her career as a college athlete. 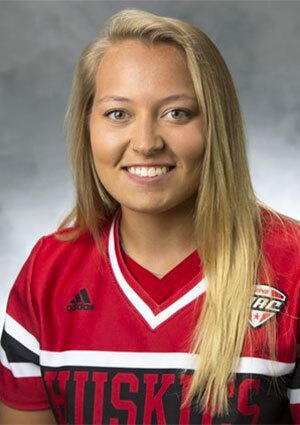 During the 2018 season, Frenz led the Huskies with a 12-7 record with a 2.61 ERA, placing her eighth in the Mid-American Conference. She struck out 56 batters to tie for the team lead, and started four of the five MAC Tournament games that carried NIU to the championship game. Frenz also was selected as an Academic All-MAC recipient. Frenz, who will graduate in May, is currently debating whether to pursue a master’s degree or to find work with a sports team. More information about the Kinesiology major is available online.